Do You Have a Fleet Safety Program? Transportation is a risky business. With 2,083 fatal occupational injuries in 2016, transportation is linked to the most such deaths on the job in the US, according to data from the Bureau of Labor Statistics. It is a broad category covering anything from one unfortunate pedestrian struck by an aircraft propeller two years ago to fatalities linked to animal transportation. But about 60% of these deaths happen on the road, with pedestrians hit by vehicles and non-road vehicle accidents coming in second and third. Working in the transportation industry is as dangerous as it gets. June was National Safety Month, but we believe safety should be the focus all year long, especially when it comes to driving. So let’s talk about what you as a business manager can do to improve fleet safety. What is a fleet safety policy? In short, it is a written document that explains what different people in the organization should do to ensure road safety. 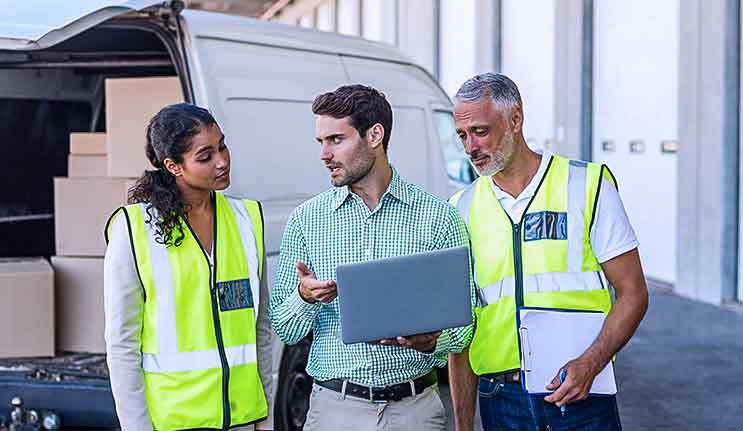 It outlines what policies the company has for safe driving and it gives fixed guidelines for how to select, evaluate, and, when necessary, discipline drivers. This policy document should of course adhere to local, state and federal laws. As a manager, you can use this policy when hiring new drivers, training your staff and maintaining your vehicles. It is essential for both you and your employees to make rules clear and transparent in order to minimize accidents. This approach also helps in sensitive situations when you need to test for alcohol and drug use. If you are a commercial driver, road safety is obviously a priority—or at least it should be. Some 4,400 large trucks and buses were involved in fatal crashes in 2016, according to the Federal Motor Carrier Safety Administration. You do not want to be part of that statistic. For a business owner with employees driving on the job, road safety should be just as important. If an unsafe driver or vehicle causes an accident, which you could have prevented, you may face steep losses from litigation, insurance premium hikes, settlements and bad publicity—it may even cost you your company. Remember that fleet safety is not a one-man show. Managers set the policies. Frontline supervisors ensure procedures are followed in practice. Drivers follow the established procedures. And safety managers help everyone fulfill their roles and evaluate how the policy is working. Who drives? How do they drive? Just because someone has a valid driver’s license does not mean this person is necessarily suited behind the wheel of one of your company vehicles. You may want to set a minimum age requirement. Maybe you’d like to mandate a floor for years of driving experience? You also need to consider what class of license is needed for certain types of vehicles. New drivers are more likely to make mistakes than experienced drivers. Make sure your new hires receive the proper training, but do not forget the rest of your staff. Technical ability is important, but so is realizing the importance of defensive driving. Repeated training sends the message to your employees that this is a company priority. Also, learning how to administer CPR may save lives in the event of an accident. Before hiring a new driver, review his or her Motor Vehicle Record (MVR). For existing drivers, make sure you check their MVR at least once a year. This will help you identify at-risk behavior that could lead to an expensive incident. You may want to survey worker references from previous jobs or check to see if the person has been arrested for anything related to alcohol, drugs, or violence before signing an employment contract. Terminating a driver is not an easy decision, but in some exceptional situations it is necessary. A driver with a record of multiple minor violations over the past 3-5 years, one major violation such as a hit-and-run or a DUI in the past 5-7 years, or any fatal collision, probably should not be driving for you. A sound fleet safety program should cover all vehicles in use—from tractor trailers to buses and SUVs, whether company- or staff-owned. Make sure all vehicles, including those owned by employees if they are used for work, have the appropriate insurance coverage. Make a maintenance schedule and stick to it. Decide what kind of inspections drivers must conduct before they start driving and after returning. All cars should be equipped with an emergency kit and drivers should know who to contact if there is trouble. Drivers are responsible for reporting maintenance and safety concerns. Managers are obligated to make sure any safety concerns are addressed as soon as possible. It is important that this question is answered in the fleet safety program and reviewed during training so all your drivers know what to do. Here is a useful guide for how to act after an accident. A driver’s first priority should be to ensure his or her own safety and the safety of others by, for example, making sure vehicles and people on the side of the road are clearly visible. Contact the police and emergency services if necessary and only administer CPR if you are trained to do so. The driver should collect information from others involved in the accident but tread carefully. Admitting fault before the accident has been investigated is a bad idea. Making sure your drivers have access to a camera or camera phone is helpful for documenting vehicle damage and road conditions. The police should be able to provide a case number and information on how to obtain a copy of the accident report. As soon as possible, the driver needs to inform the employer about the accident and comply with any necessary drug and alcohol testing.